The popular drama series The Moon Embracing the Sun will welcome a new phase after episode 14. On February 15th, 2012, the production team of The Moon that Embraces the Sun revealed to Osen in a call that after episode 14, the drama will usher in a new phase. Therefore, episode 13 and episode 14 are expected to be the important connecting link. With the conflict between Hwon (Kim Soo Hyun) and Yang Myung (Jung Il Woo) in full swing, many events are underway, and the plot will be more dynamic, raising expectations. The drama has recorded the ratings of 37.1% for three episodes consecutively, with 40% in sight. But because of the slow development of the plot when comparing with the beginning of the drama, it’s now in the state of grumble gradually increased. But with the failed consummation of Hwon and the queen, the strike back by the queen who harbors resentment and Yang Myung who is unwilling to give up Wol is injecting vitality to the drama. At the same time, when will Wol who lost her memory can recover her memory is also an urgent matter that worth to pay close attention to. The plot is expected to firmly attracted the audience’s attention. 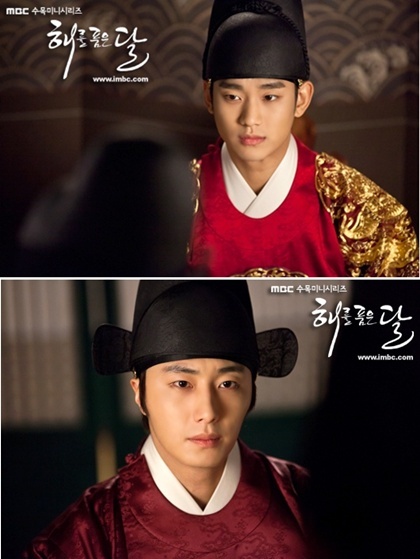 After catching the breath, can The Moon that Embraces the Sun breaks through 40% ratings mark? The promotion for the second half of The Moon that Embraces the Sun is raising the expectations.